PurePro R Reverse Osmosis (RO) is recognized as one of the best available technologies for producing best quality drinking water. It's also the same method used by many bottled water companies to make safe and great tasting water. No other home water treatment system can offer you as much protection and reliability. 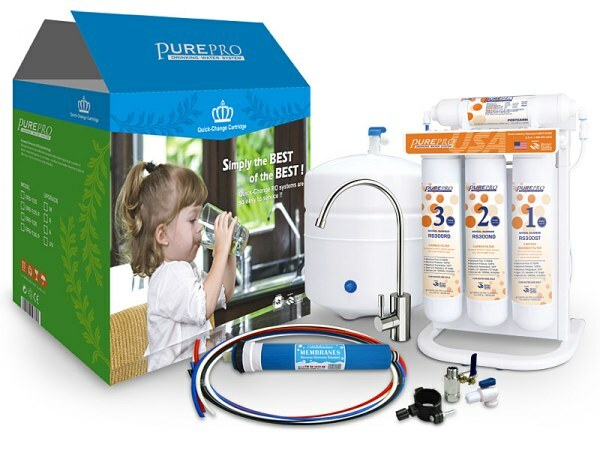 EZ-105 comes complete with a NSF certified 3.2 gallons water storage tank, PurePro USA membrane and all the necessary fittings, installation kits, extra color 1/4" tubing, and a long-reach chrome faucet. Use easy-change cartridge design makes filter changes fast, clean and easy. EZ-105 system provides your family with premium water for drinking and cooking at a fraction of the cost of bottled water. That means no more deliveries, heavy containers, storage problems, spills, or bottle deposits. Reverse Osmosis (RO) drinking water systems include mechanical filtration to remove particles, carbon absorption and absorption to remove chlorine, taste, odor and chemical contaminants, as well as membrane separation down to 0.0001 microns. RO membranes remove dissolved solids at the ionic level. No other purification system can provide better removal.